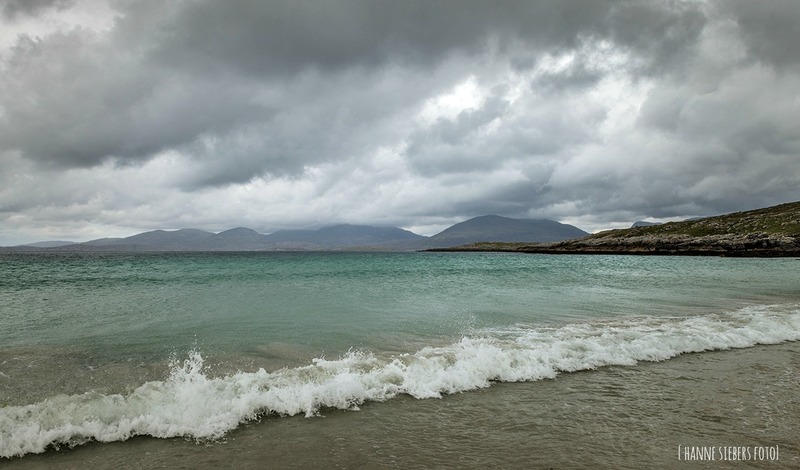 South Harris, Outer Hebrides. Everyone advised us to visit Lyskentyre, so off we went. Dina was speeding first in her white Jaguar and Siri and Selma were slowly following in their VW camper van. Would Dina not have stopped frequently for taking pictures, she would have darted off out of sight of our dear Bookfayries. But in the end we all stayed together reaching Lyskentyre. Wir näherten uns Lyskentyre. Dina brauste vorweg in ihrem weißen Jaguar und Siri und Selma schlichen hinterher in ihrem VW Bus. Würde sie nicht ständig zum Fotografieren stoppen, wäre sie längst unseren lieben Feen davongefahren. So also ging’s gemütlich durch karge Landschaft. The grey sky reached almost down to the barren landscape. But then, what a surprise, a beach looking a bit like the Caribbean sea appeared. Dina was so taken by this view that she braked hard (Siri and Selma nearly run into her), got her cameras, jumped out of the car and very excitedly, mounted the lenses. Grau war der Himmel aufs Land gefallen und dann völlig unerwartet absolutes Erstaunen: ein Strand, der geradezu karibisch wirkt. Der Verwunderungseffekt ist umwerfend und ließ Dina hart bremsen und sogleich emsigst ihre Kameras zücken und aufgeregt an den Objektiven herumschrauben. Lyskentyre Beach on South Harris was described in our travel guides as one of the most spectacular beaches in the UK – and it really is. It was voted UK’s beach number one in 2016. It’s famous for being the setting of the BBC’s Castaway. We didn’t have just the right weather for a swim but we are weather proof and enjoyed the magnificent landscape very much. Lyskentyre Beach auf South Harris gilt als einer der schönsten Strände Schottlands und wurde 2016 als schönster Strand im UK gewählt. Wir hatten nicht gerade Badewetter, aber wir sind ja wetterfest und die Stimmung dort hat uns sogleich gepackt. Sie ist so romantisch, dass einige Paare hier heirateten. “What makes us perceive a landscape as beautiful?“, Siri and Selma wanted to know. Of course we were touched by this scenery but to answer what makes us see a place as beautiful, we really had problems to answer. Siri und Selma, die wie wir hin und weg waren, fragten uns, was denn eine Landschaft einem als schön erfahren lässt. Natürlich berührte uns sogleich die Schönheit, aber zu beantworten, warum eine Landschaft als schön angesehen wird, fanden wir schwer zu beantworten. Die Spannung zwischen Berge und Meer wie auch bei den norwegischen Fjords lässt einen Strand als schön erscheinen wie auch der Widerspruch zwischen der Weite des Sandstrandes und der Höhe der Berge. Dazu kommt das Licht, das alles mit vielen Farbnuancen in Szene setzt. Siri meinte, hier sei alles so groß und die Menschen so klein, dass man sich unwichtig vorkommt. Das ist eine enorme Entlastung, da man sich zu oft so lächerlich wichtig nimmt – wobei Selma gleich hinzusetzt, dass dies jedoch nicht Feenart sei. Sie beendet unser Strandgespräch, indem sie meinte, Schönheit brauche keine Erklärung. “Ist Schönheit perfekt dosierte Spannung?” fragten wir uns, bevor wir endlich still den Strand entlang liefen. Auf dem Rückweg sahen wir dann diese kuriose Bushaltestelle. In this barren, nearly unpopulated landscape, where the sheep are marked with the colour of the sea, one wouldn’t expect a bus stop. If and when a bus will come who knows? We found neither a bus stop sign nor a timetable, but of course, the locals know and will wait in style. In dieser kargen, beinahe menschenleeren Landschaft, wo die Schafe mit der Farbe des Meeres kennzeichnet werden, würde man keine Bushaltestelle erwarten. Ob ein Bus kommt und wann, wer weiß? Es gib weder Halteschilder noch Fahrpläne. Als Einheimischer kennt man das Geheimnis und wartet stilvoll. Concerning beauty see our post about ugliness. Our dear Master at Lyskentyre Beach as seen on Instagram. This entry was posted in Scotland and tagged beauty, Castaway, Harris, Lyskentyre Beach, South Harris, The Outer Hebrides, UK's best beach, wedding beach. Bookmark the permalink. Beautiful Pictures of the Earth Dina!! God Bless you!! Love Always and Shalom ( Peace)!! thanks for liking Dina’s pictures. It’s such a cold, hard looking landscape, but your photos are just outstanding. They show the raw beauty of the land and sea. this is just as we like it: barren stones, cold, the feeling of the north, although it’s not that much north. There is a rugged beauty in this landscape. Barren is surprisingly beautiful captured by the eye of the right beholder! as we like such barren landscapes Dina is able to set it beautifully in scene. you have to be quick because the Outer Hebrides like northern Scotland are getting more and more touristy. Oh dear, and we help with our post that it gets more popular 😉 We keep our fingers crossed that you soon find the possibility to go there. Yes, I hope so too! I mean, that I get to go there soon. Maybe if I go during the winter, there won’t be so many tourists 😊😊😊. How dreamy the photos are! Beauty indeed does not need any explanation. You four are right about that. As long as the senses are soaked in the beauty, who cares about the whys and the wherefores 🙂 Is it Eilean Donan next up? Well, does beauty needs an explanation? Actually is self-explanatory on one hand, on the other we want to understand it. Why? If one doesn’t think about beauty one oft produces kitsch. Our Master would say, beauty is there to be understood. But there is the question what’s really meant by understanding. Anyway let’s leave this highly pholosophical question. You are welcome, Klausbernd. It is indeed a philosophical discussion that could incite many passionate voices. I simply think beauty should be admired for the sake of beauty and leave it there. Just as you point out too. The chronology of it hardly matters. What matters is the surreal beauty of the Scottish islands and you capture it so beautifully. und danke fuer die fantastischen Fotos: eine wahre Augenweide. Es war mal wieder ein Genuss, diesen Beitrag anzuschauen. Aber auch zu lesen, denn derText war – wie immer – auch absolut anregend. Und so freue ich mich dann schon auf den naechstenBeitrag. ja, mit Fotografen zu reisen ist sehr meditativ und im Auto kann’s ziemlich aufregend sein. Wir Buchfeen müssen stets morgens die Frontscheibe so fein putzen, dass man sie gar nicht mehr sieht. Wir haben immer Scheibenreiniger im Auto, um die höchste Durchsichtigkeit aufrecht zu erhalten. Huch, da wird unsere Frontscheibe zunehmend dünner bei all dem Rubbeln 😉 Es ist schon ideal, dass Dina auf den Hebriden ein offenes Auto fuhr, es ersparte uns viel Wischiwaschi. Übrigens unsere liebe Dina ist mal wieder weg 😦 Sie ist in Norwegen, wo es ähnlich warm wie hier ist – zu warm! The soul is happy to sense beauty. It does not require explanations. Your photos are marvelous. as we wrote above, you have to be quick as the Hebrides as northern Scotland are getting more and more popular. And in a way too many tourist will steal the beauty. I’ll just enjoy your photos again and consider myself to have been there vicariously. I hate the idea of going to remote places only to find that the rest of the world has gone too. It’s not only self-defeating, but of course can be so damaging to the natural (and social) environment! We are seeing the same trends in NZ as more and more visitors come to enjoy our “unspoiled” country. So starkly stunning and the bus stop is a classic! We saw several bus stops like this. First we couldn’t believe it that these were bus stops. beautiful photo. It’s a dream of my husband to visit the Outer Hebrides. Kind regards, matroos Beek. We keep our fingers crossed that you soon you will find a way visiting those beautiful islands. das haben wir uns gedacht, dass dir das Haltestellen-Bürostuhl-Foto gefällt. Echt bizarr, aber praktisch, gemütliches Schreiben auf dem Tablet bis der Bus kommt 😉 wenn er kommt. Ja, haben wir und unsere liebe Dina meint, das sei eine Verschwörung gegen sie, wenn auf den superengen Straßen auch noch ein Bus entgegenkommt. Oh I love this report from the Hebrides. I suspected the Outer Hebrides to be special, close to landscape form like our arctic part of the world. Little vegetation and no trees. At all? It mus be a revelation to see something like this special place, a beach like another continent. I discussed the beauty of a landscape with Dina on the phone yesterday. For us, the beauty of a place certainly has got something to do with the light. Light plays an important role in Sweden and Dina’s homeland Norway. Whether it’s there or not. Now we have plenty and it’s magic. In winter we have less to none and it’s also magic. The darkness opens up for way for the Northern Lights, the most magic lights of all. In Gothic architecture, light was considered the most beautiful revelation of God and thus playing a major role. Love and hugs to you all from my lovely stuga! the arctic regions as the Hebrides are formed by ice and therefore they are quite similar in their basic landscapes. You are right, there are hardly any trees on the Outer Hebrides, only in sheltered positions. We absolutely agree with you, beauty has to do with light. It’s the light that creates a special atmosphere. Therefore you find in the Islamic and Christian world the idea that god is light. And especially when photographing you are playing with light. But in postproduction of their pictures many photographers destroy the great natural light by inserting special light effects and suns and immediately turn a beautiful picture into kitsch. I agree with your comments on post-production! It seems to us that most of the post-production programmes replace the beauty of nature in a pic with some tasteless mainstream images, like posters in cheap furniture shops. You find a lot of those pics in the net like overdone sun sets and skies etc. – but, what a shame, people seem to like them. Ha en god St. Hans helg! we think about driving the Atlantic Highway as well – but we have to save some money first because your country is so horribly expensive. But then we have done the two most beautiful road trips in the world as voted by international photo-journalists. Coming from England it is easy to combine a trip to Skye, Lewis and Harris with the NC500. And the biggest thrill, from Ullapool don’t take the main road (NC500) but take the “wee-mad-road” – absolutely magnificent. But drive very careful – a bit tricky to drive. St. Hans helg? We didn’t even know that there was an hl. Hans. Did you make that up? ja, das ist eine Gegend, die ideal mit dem Wohnmobil zu bereisen ist. Aber auch schwierig ein Wohnmobil auf den engen Straßen zu fahren, nehmen wir an. Dina war selbst ihr Jaguar zu breit. Wunderschöne Bilder, die so viel Weite zeigen – und immer wieder einen anderen dramatischen Himmel. Und dann auch noch die wunderbare Bushaltestelle. besonders am Anfang unserer Reise hatten wir typisch schottisches, stark abwechselungsreiches Wetter. Ja weiter wir gen Norden kamen, um so sonniger wurde es, dass Dina sich über den langweilig blauen Himmel beschwerte und es uns teilweise zu warm wurde. Wir sahen mehrere ähnliche Bushaltestellen – voll cool, nicht?! Flott bildeserie fra et fantasisk landskap! Dette er berørende vakkert for en Nordlending som meg. takk – thank you very much. You are right it’s the ideal landscape for somebody who loves the North. Oh, we didn’t know that. It was for us the first time we saw such a bus stop. No, beauty doesn’t need asn explanation. Your pictures say so much. thanks a lot for commenting and for liking Dina’s pictures. Pustekuchen – nix nordisch kühle Luft. Ja weiter wir auf unserer Reise gen Norden kamen, desto wärmer und sonniger wurde es. Aber jetzt in Cley ist es nach heißen Tagen mit etwa 30 Grad sehr angenehm. Wir haben feine 22 Grad mit einer leichten Seebrise – übrigens ein Wort, bei dem mein Rechtschreibeprogramm die Falschschreibung -briese vorschlägt. Davon schicken wir euch etwas rüber. Siri und Selma stehen schon auf dem Dach und blasen und blasen das Wetter zu euch. Aber, bitte, bitte, wir möchten auch etwas: REGEN! Seit wir wegfuhren hat es hier nicht mehr geregnet, die Wassertonnen sind puptrocken und die Blümchen traurig. Also Outer Hebrides und Nordschottland könnt ihr doch easy bereisen. Das müsst ihr unbedingt mit dem Auto machen und bloß nicht zwischen Mitte Juni und Ende September. Der Herbst ist dort sicher megaschön, wir würden Oktober vorschlagen. Ihr benötigt für solch eine Reise incl. Hebriden etwa 5 Wochen. Man kann’s auch in 4 Wochen machen, aber ich denke mir, ihr liebt es wie wir easy, easy. Dina ist mal wieder in Norwegen, wo es leicht kühler ist als hier. Dort regnet es zumindest ab und an – wir sind voll neidisch! Es hat hier übrigens gerade für 5 Minuten leicht geregnet, aber jetzt scheint schon wieder die Sonne. outdoor office – we had the same idea. We suppose that October is a good month to travel up north because tourists and midgets are gone. Before you go, come around, please, we will give you some hints. Dina is again in Norway right now but she’ll be back in the middle of July. We should meet then. Lovely photos Hanne! You’ve got the eye. I love the expansiveness of these images – sometimes bleak, sometimes ethereal. Just looking at them gives one a sense of opening from within. It must have been a fabulous trip. Fairy filled camper van following snazzy jag by these sea and landscapes is its own wonderful image. And that bus stop – well, what can on say, blissful pragmatism in changeable climate or highway to another dimension. Happy weekend Fab Four. we had the same feeling: Being in this landscape is opening up to an inner freedom. Splendide endroit, et très belles photos. Me fait un peu penser à un mélange entre l’Islande et les Highlands d’Ecosse. Thank you very much for liking Dina’s photos 🙂 You are right it is similar to Iceland there, but not that touristy, and the northern Scottish highlands. Wir fanden besonders die äußeren Hebriden und den hohen Norden Schottland einschließlich den Orkneys toll. Da hast du wohl recht, lieber Jürgen. Auf der anderen Seite bringt der Tourismus der eigentlich armen Gegend etwas Wohlstand. Die Leute machen jetzt B&B und es entsteht eine Tourismusindustrie, die es erst ermöglich, diese abgelegenen Gegenden zu bereisen, auf der anderen Seite auch dem Abbruch tut, was der Tourist sich wünscht, nämlich alleine in der Wildnis zu sein. Die verheerendsten Auswirkungen erlebten wir auf unserer Rückfahrt am Loch Ness. Dort ist es vor Touristennepp nicht aushaltbar, wir flohen quasi. Stunning scenery and beautiful photos! Well done! As always, the captured magnificence of a bleak but compelling landscape is artfully contrasted with interesting philosophy about why we find it to be so. Scenes from nature such as these put our small and transient lives into perspective, making us feel a part of something far bigger than our petty concerns. We think this feeling of being unimportant gives a freedom we all are longing for. The German author Goethe saw polarity as the mayor force of nature and we guess it’s polarity that makes us to perceive something as beautiful. Selma has it about right. I would add an ability to evoke a mood – and these superb landscapes certainly do. Yes, Selma is a clever Bookfayrie indeed! Such a spot! 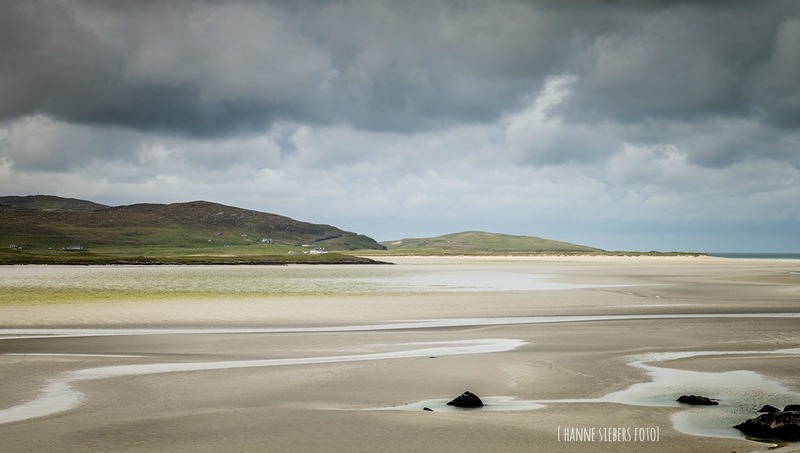 The Outer Hebrides are number 1 on my list of places to visit–and this post with the glorious photos, just reinforced that placement! we loved it at the Outer Hebrides. We were amazed how big Skye is. What can I say? You show up with outstanding images of a beach that rivals those of the Pacific, tales of roaring toward a quiet village and oddities like a bus stop on no known route!! Always so enjoyable to stop in and see my friends. And, Klausbernd, great pose on the beach! Have a wonderful weekend, all of you!! thank you very much 🙂 🙂 Your comments are always so kind! We didn’t exspect such beaches on the Hebrides, but Dina and Selma studied a lot of guides before we went. So we knew where to go. Actually our dear Master likes to be Dina’s model 😉 – he likes posing for her, but that’s a secret! we know that you are a reliable friend of the Bookfayries. Thank you! we were taken by the colours of Lyskentyre too. It’s a bit otherworldly. Dina was very happy that the weather was changing constantly and she couldn’t stop taking photographs. We don’t know how you reached that beach in the 90s, nowadays it’s easy to reach by car, nevertheless it was not too touristy. As I recall, we didn’t get right onto the beach, but still got same amazing views, and what especially delighted me was seeing a ewe and her lamb walking on the sand. Alas, I only had a 50mm lens on the camera at the time, so they were a bit small on my photograph as they were a little way away,…. Oh, and have a lovely weekend! Today it’s an easy short walk from the car park to the beach. Unfortunately we didn’t see sheep on the beach, wasn’t the right weather for bathing for the sheep. Hmm, makes me want to go back…..I have been searching for my sheep on the beach image for you, can’t find it at the moment…. It will be a gardening weekend. Very good, may your garden flourish! We asked our dear friends the flower fairies to make “grow grow grow”-magic. Lucky you!! Fantastic photos which make me long to pack my bags and head for Scotland and the islands!! We could immediately go to the Hebrides again and actually do the whole trip again. Scotland is really great! If Scotland would become independent we think about moving up north. Not only the landscape is great all people we met were very friendly – and pro European. Yes, I know dear Klausbernd. Sure u 3 are missing her badly. The best of Celtic wishes to you!! Well, we know, but it’s much nicer with her. We miss our dear Dina very much! Gorgeous photos and a very grand beach, indeed. A few of the shots of the countryside remind me of of Western Marin County here where I live. I look forward to more photos of Scotland. they will come! 🙂 We are working on it. We lived a time in Vermont and Maine, there it’s similar as well. Unfortunately we don’t know the west coast of the US. You might checkout Point Reyes in Google Maps. If you go to the Street View you will see some rolling countryside and beautiful beaches. We are about 20 miles inland from Pt. Reyes. Schottland ist wirklich eine Reise wert. Dort gibt’s auch einige Jugendherbergen und viele Hostels für Wanderer. Na prima, das passt doch. Und außerdem sind die Leute in Schottland eh gastfreundlich. Dir wird’s gefallen. There are just too many terrific photographs to pass comment on! They make me want to go there, walk on the beach, stare at the hills, talk to the sheep and wait for a bus! Dreamy, wild and romantic! This part of Scotland is indeed dreamy, wild and romantic, worth visiting. Thank you Klaus! Some years ago I went on two diving trips to the Orkneys. Loved that island – all windswept. We dived the German WW1 wrecks in Scapa Flow. Great memories! I can imagine that this was quite an adventure. We only saw those blockage-ships at Scappa Flow. And I have to admit I don’t like my head being under water. Did you visit Skara Brae? We might present some pictures from this megalithic village. We all have great memories of our staying on the Orkneys too and I suppose we’ll visit those islands again. We want to go back to Orkneys as soon as possible. By the way, do you know “The Outrun” by Amy Liptrot (Edinburgh 2016)? You learn a lot about the Orkneys reading this autibiographical novel – well, it’s hard to say if it is a novel, something like memoires. We think it worth reading it when you like the Orkneys. “The Outrun” has actually two levels. One is the Orkneys and the everyday life there, the other is alcoholism. But it’s more Orkneys than alcoholism. It’s beautiful, I just love the expanse of it. Wow, the beach is vast … We walked it for nearly two hours but didn’t come to its end. I for one am thrilled Dina stopped to take pictures. These are wonderful. Thank you for sharing about your travelling. Indeed its pleasure to visit far away places from someone else’s pen and camera. Great post with stunning photos of a place I long to visit one day. Scotland is really worth visiting! Barter Books is Bookfayrie Paradise. If you love books it’s a must! Oh dear, we can tell you to carry all of Dina’s cameras and lenses was a Sherpa-job. Wasn’t it great when photographers travelled with mules! Oh dear, even we Bookfayries had to carry as well! our Master told us that Kant, Hegel and Adorno thought a lot about beauty. For Kant beauty is archetypal but we don’t agree. We think beauty is dependent on the culture the perceiver lives in. Since the 18th c a difference was made between the Naturschöne (beauty of the nature) and Kunstschöne (beauty produced by people). An old idea was that the Naturschöne is an “An-Sich” (Kant) and the Kulturschöne a “Für-Sich” (Kant). There was always a discussion if the Naturschöne, we wrote about, is kind of god-made or antropocentric. We Bookfayries suppose it’s antropocentric, meaning depent on the perceiver. Anyway, we Bookfayries tried hard to understand this all and hope we understood what our dear Master explained. thank you very much for an important point you made. Beauty needs to be shared. Beauty gets even more beautyfull if you can talk about it. Did you read Kant? I, Klausbernd, find Kant quite hard to read not only because of his extremely long sentences. But I like him as a forerunner of the enlightenment. He was quite a modern thinker in his times. Beauty is balanced tension of opposites. We love this idea very much as well. indeed, Scotland is worth a visit, especially the north and the Hebrides. The skies have been pretty heavy here today too (the evidence is on Instagram 🙂 ) but it’s easy to forgive in a landscape like that. Pure drama, isn’t it? Wishing you a peaceful, happy weekend! Dina always asks Siri and Selma to blow different clouds over the place she wants to photograph. It works pretty well, as you see. We have here dark grey and white clouds today – but Dina is not at home and our dear Bookfayries did no blowing. Have a peaceful holiday as well and thank you. I’m with Siri – it is very refreshing to be made to feel inconsequential. For me personally, the feeling has always been a kind of coming home, an all’s-right-with-the-world feeling, when I am dwarfed in a landscape. That adds a spiritual dimension, which isn’t a requirement for beauty, but certainly enhances it. Gorgeous photos my friends! So spacious, and empty — but full. Thanks a lot for liking Dina’s pictures. We agree that beauty needs a spiritual, emotional or mental dimension. It has to move our innere self. You brought your wellies with you on holiday! ! 🙂 That’s great part of a mobile holiday with a car. You look very smart on the beach, Klausbernd. I’m with you: YES to beauty and NO to mass tourism. Hmm, do I sound egoistic now? I didn’t mean to. To preserve the beauty, it’s important to look forward and plan carefully. I’m sure the Scots are sensible. Mass tourism is currently ruining the charme of Iceland. Even we had our little fairy boots. you wouldn’t believe it how much stuff we carried in our cars. We were equipped for nearly every weather and adventure. Fortunately we had the VW bus and the Volvo estate. In Dina’s Jaguar fitted just a handbag. Mass tourism kills beauty, what actually shows that beauty is antropomorphic. We hope that the Scotts are clever enough not to be taken by the tourist business in a big style. we love it when our eyes are able to see the end of the horizon. And especially after having written the whole day on the computer it’s really relaxing. We have such vast beaches at the North Norfolk coast as well, but where we live there are too much trees blocking our view in the summer. It’s fine during winter time. die Spannung ist der Landschaft inhärent: der flache Strand vs die steilen Berge, Wasser vs Fels, die bunten Farben des Wassers vs die neblig grauen Berge etc. Was du über die Musen schreibst, gefällt uns SEHR. Siri und Selma sind eine Inkarnation der Musen, zumindest sehen sie sich so. Have a fab weekend in the garden guys! We suppose we need contrasts like we=small vs sea=big, sea=deep vs mountain=high, people=mortal, landscape=kind of immortal etc. because contrasts stimulate our brain. A vast plain without any contrast is boring. And of course water is appealing for us because it’s an archetypal symbol for life, C.G.Jung was one of the first who noticed this, but actually Freud had similar ideas before him. actually we started to call Hanne with her second name Dina and so Hanne became Dina in the virtual world like Klausbernd became our Master. It’s all Bookfayrie-magic. We agree, light is everything and the stuff that photography is made of. The changing weather in Scotland means changing and dramatic light. Dina was always hoping for cloudy weather but, oh dear, in the very north we had bright sunshine and blue skies. Love it. All that nature and a bus stop with an office chair. Priceless! we love the Scottish nature and as further north you go as more magnificient it gets. Gorgeous images! I think silence adds to the beauty of these vistas. Magnificent nature, light and of course silence make beauty – sorry, we forgot the sound of silence. But you are right, noise destroys beauty – if it’s not a natural noise and too loud. Diese Plätze gibt es, den Strand, das Meer….da weiß man doch wieder, warum man Erde gebucht hat! Und ihr habt sie “eingefangen” mit der Kamera…. Großartige Bilder und philosophischer Text! Die Bushaltestelle ist mit extrem sympathisch, so würde ich gerne leben…. entspannt warten ob der Bus kommt oder auch nicht…. Wisst ihr, die sind gnadenlos da unten, die Oldtimer-Fans, eine sehr laute Band spielt Lieder: nach “Country Roads” jetzt “Eiszeit” von Peter Maffay…ich muss hier weg….Siri , Selma habt ihr einen Tipp für mich? Please!!!! Oder helft ihr mir rockend und rollend den Hausputz zu erledigen, damit ich schön verreisen kann in den Ferien?! Wie gesagt: Nordwest Schottland – atemberaubend schön, freundliche Menschen, alles fein – auch der Whisky und Gin 😉 und Musik wird wie in Irland auch aller Orten gemacht. Ja, ist so eine Welt nach Bookfayries Geschmack! Wir würden gerne in Schottland wohnen. Herzlichen Dank, liebe Pia, dass dir unsere Post gefällt. Ja, prima, dass wir die good old Erde buchten 😉 es hätte schlimmer kommen können. Also ab in den Norden Schottlands! Oh, du Arme. Wir waren wohl einen Monat früher unterwegs und sind von keinen Midgets angegriffen worden, ehrlich gesagt, haben wir keine gesehen oder gar gespürt. Wir fanden auch, dass alles im Norden der Highlands, der Nordküste und auf den Orkneys perfekt war. Wir könnt sogleich wieder losfahren. gern geschehen. Wie wir schon weiter oben schrieben: Schönheit bedarf des Teilens. Some places of Scotland’s westcoast are similar to Ireland, well, formed by the same geological powers. It was an adventure indeed, especially up north on tiny roads but magnificent. There are more pictures to come with a text by our beloved Bookfayries Siri and Selma. We are writing and combining Dina’s pictures. You know we need time and post every fortnight. But we can tell you, the next post will be about a Scottish fairy tale castle – no, unfortunately not our home. Looks like an amazing place to spend a sunny day. Actually we are not these sun-and-beach-people. We had lots of fun there with a mix of rain, sunshine and fog. Dina loves this weather for photographing. Bei solchen Bildern kann man einfach nur ins Schwärmen geraten und man wird auch ein wenig neidisch darauf, dass Ihr das alles in der Wirklichkeit erleben und bewundern durftet. Das war sicher noch ein wenig atemberaubender als die Fotos, die ich gar nicht oft genug anschauen kann. Und wieder gibt es bei Euch nicht nur tolle Bilder zu sehen, sondern auch eine interessante Frage zu beantworten. Was ist eigentlich Schönheit? Da fällt mit wieder dieser berühmte Satz ein: “Schönheit liegt im Auge des Betrachters.” Ich denke, da ist durchaus viel Wahres dran. auch wenn’s vielleicht platt ist, aber wir finden auch, dass Schönheit im Auge des Betrachters liegt. Wir glauben nicht an Schönheit an sich. Tja, wir lieben so unsere kleinen Abenteuer und die lieben Buchfeen sind mit der liebcleveren Dina stets schnell dabei, alles zu organisieren. Das war auf jeden Fall eine megatolle Reise auf teils abenteuerlichen Straßen. Die Landschaft im Norden ist großartig, aber davon werden noch Fotos kommen und unsere Buchfeen hecken sicher tolle Texte dazu aus. Danke, dass dir unsere Post gut gefällt. Bis dann. Another delightful post. 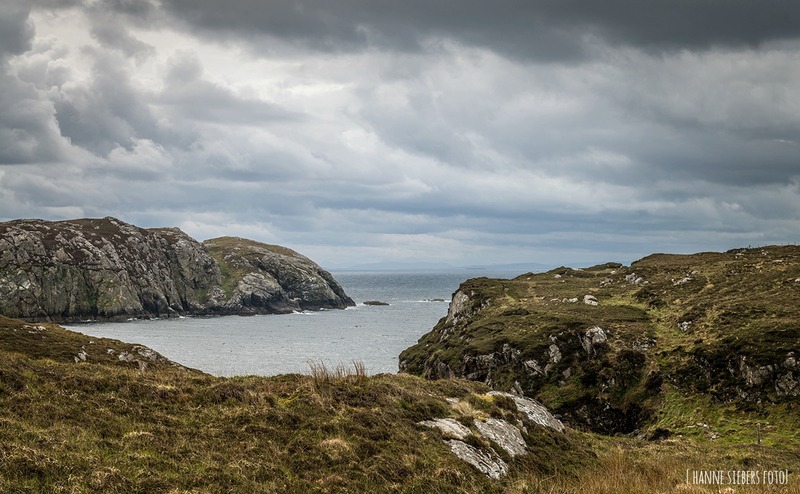 The photographs capture the magic of the scenery and atmosphere of the Isles – and we have an interesting philosophical problem to ponder on too. beauty is something we use to take for granted, especially the beauty of nature. But we find it interesting what beauty makes beautiful. A classic Bookfayrie question. Maybe we don’t need to find an answer but it is helpful to think about. We really liked Harris and Skye as well. You go to the Shetland islands. We have never been there but we love to go. Orkney was the farthest north we have been in Scotland. Next time we go up north we will surely visit Shetland as well. If we understand it right you will live on the Shetland islands. That sounds GREAT. Happy moving – you are going there from Belgium, don’t you? What a difference! We very much hope you’ll blog about your life there. Oh Skye is lovely, I have been there as well as on isle of Mull and I cannot wait to discover all the other Scottish islands. I’m from Belgium but I have been living in Yorkshire for the past 2 years now. It will still be a change of scenery for sure and another way of life! It sounds very exciting and we cannot wait! I’m planning to blog about my life over there for sure! We really look forward to your blog about the Shetlands. Good luck for your new life there! The Scottish islands have a beauty and atmosphere all of their own. Love the bus shelter. indeed, the Scottish islands are very special. We fell in love with the atmosphere there. Excellent captures! Were you using a graduated density filter on the skies? no, Dina didn’t use any filters and the sky is not a product of post-production. It’s all real. But our dear Bookfayries are always asked by Dina to work their magic for having dramatic clouds. I only photograph in RAW and the postprocessing is done in Lightroom and PS. I’m not really good at this, so I’m experimenting and trying to find “my” expression. I’m not quite there yet, but eventually … I love being outside with the camera, but not so the post processing, which is equally important. This part is often neglected and thus I have piles of images waiting for me. So much to see and do! 🙂 Have a great Sunday! Driving in Western Australia in the Springtime is particularly fraught, as there are so many different beautiful wildflowers to photograph and you have to be a bit careful that you don’t get wiped out by other motorists! Luckily, many of the key wildflower spots like Lesueur National Park have one-way drives through them with plenty of safe spots to stop to take photos! Same! But that’s the way you get great photos- grabbing the moment!!! It’s always so hard if the photo opportunities are perfect and you are on your way to an appointment and can’t stop to take them!!!! This open Jaguar helped. Oh dear, sometimes Dina was driving and taking photos at the same time, hair raising. We ranted with her, but that didn’t help. Hello Dina, wonderful words and pictures! You get to the heart of a magical place. thank you very much for liking our post with Dina’s pictures and our words. yes, Dina is always waiting for clouds, meaning that our clever Bookfayries have to weave some magic for clouds to appear. But they are good at this. Actually we don’t like these boring blue skies with sheer sunshine, therefore we go up north as often as we are able to. ah, we see, you are in San Diego. Yes, there are lots and lots of sheep, much more sheep than people, but not so many dogs – except sheep dogs, very clever and busy dogs. If you are not afraid of water it’s a great place for wandering around, for running und sniffing. Rugged, wild and beautiful I would describe the Hebrides, which you visited and described so well by text and photos. I had already a glimpse of the stark beauty of the islands in the North Sea, after our youngest son visited the Faroe Islands. This could definitely be the next destination for the Fab Four of Cley. 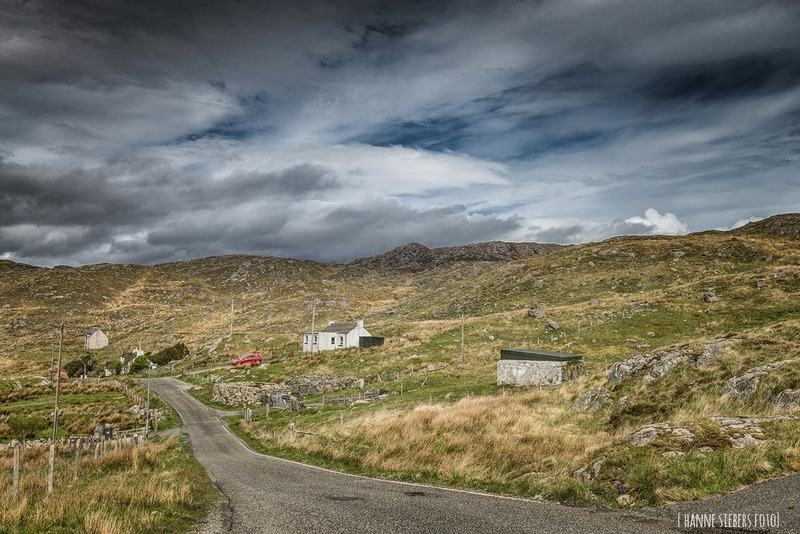 I’m watching show called Shetland that has caused me to develop a romanticized idea of life in the Hebrides. I’ve never visited the place but I did look at air flights and spent a few hours with the visitscotland.com web site. The visitscotland website provides a lot of useful information. We used it for planning our journey as well. we met quite some cyclist there as well. We explored the islands driving in our cars and hiking. Great captures Dina (Hanne) and a beautiful story. These words have touched me a lot: “Maybe beauty is perfectly balanced tension, we thought before we walked that grand beach in silence… “Thanks for sharing!!! Wonderful photos. All bus stops should be like the one you captured. Thanks for sharing. And to the Fab Four of Cley have a great week. there are busier bus stops in the world but hardly any more eccentric ones. 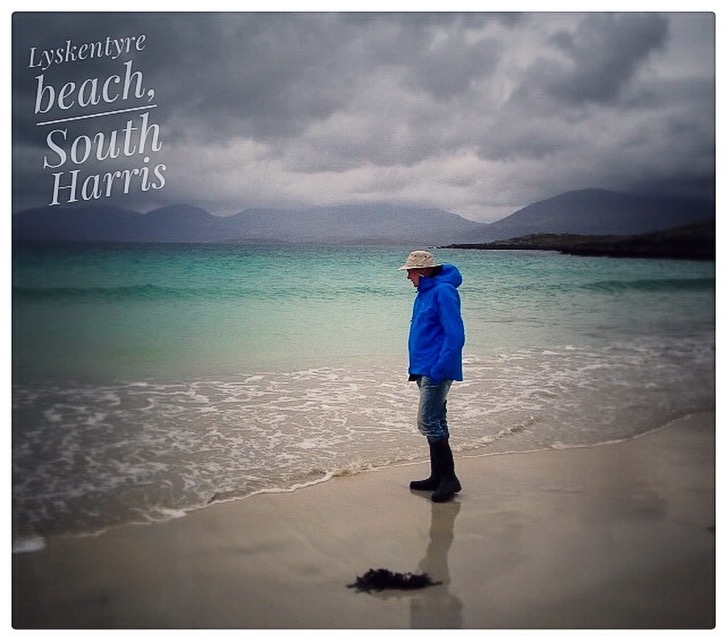 Your pictures of South Harris remind me of our trip through Barra and the Uists , then Skye and Mull early in June. My blog has a few pictures that go a very small way to expressing the astonishing range of scenery we experienced. A very special part of Britain. 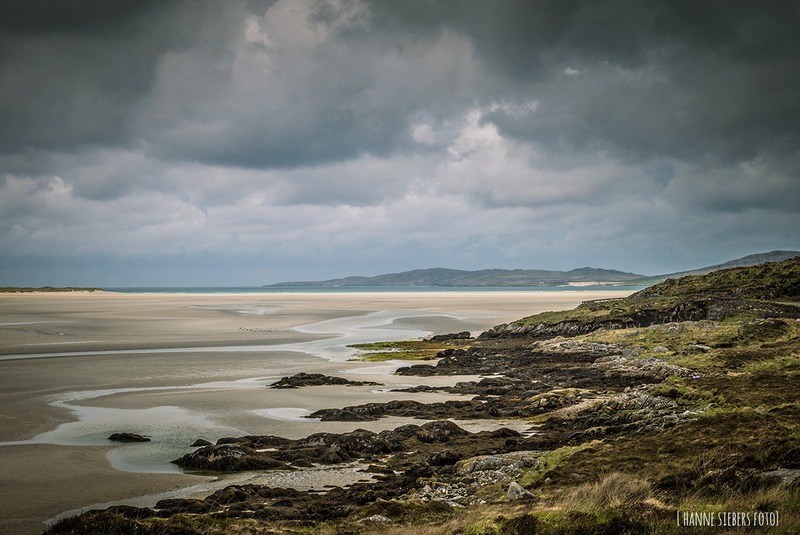 indeed, the Hebrides are a very special part of Britain worth visiting. We liked the mountainous parts where we did a lot of hiking. Did you go by bike? We saw quite some cyclists there. Outstandingly beautiful shots of these landscapes. Oooh, breathtakingly glorious. well, that’s the result when a magnificient landscape and a great photographer meet. Well put! A lovely week to you as well. More fairytale shots! Just gorgeous. and there is even more to come. yes, we fairies – especially Selma – look that all of Dina’s shots become fairytale pictures. I have been wanting to go to the Outer Hebrides forever. Your photos validate my hunch they are a special place. Did you enjoy the trip overall? We loved Skye very much but we were astonished how large Skye is. Harris is only partly beautiful, most of it is quite flat boggy land. But we liked most the very north of mainland Scotland and the Orkneys. The only place we didn’t like and fled after 2 days was Loch Ness.It’s a tourist trap not worth going. We stayed there on our way back home. They had invent Nessy to lure people to this loch (lake). We enjoyed every moment of our trip, but as said before only the loch Ness area was a boring tourist trap. We liked the mountains on Skye and the Orkneys best and driving the “wee-mad-road”. we just watered all our plants in the garden with the last water from our butts. Siri and Selma are very busy weaving some rain magic. We were very lucky on our trip we only had the odd shower on the beginning of our trip and as further north we got as more it became sunny and warm. We are divided concerning beauty: our dear Master and Siri are assured that everything needs an explanation or at least a try to explain, our beloved Dina and Selma thinks to see and be moved is explanation enough. Could it be that both are right? Beautiful beach and interesting discussion about beauty. Great! I would have slammed on the brakes as well! What a lovely beach, and how kind of you to allow us to tag along with you! it is very beautiful indeed! … and as further North we got as more beautiful, well, the better word is magnificient, it got. Thanks a lot for mentioning our blog. We say “THANK YOU” as well. Beautiful pictures as always. 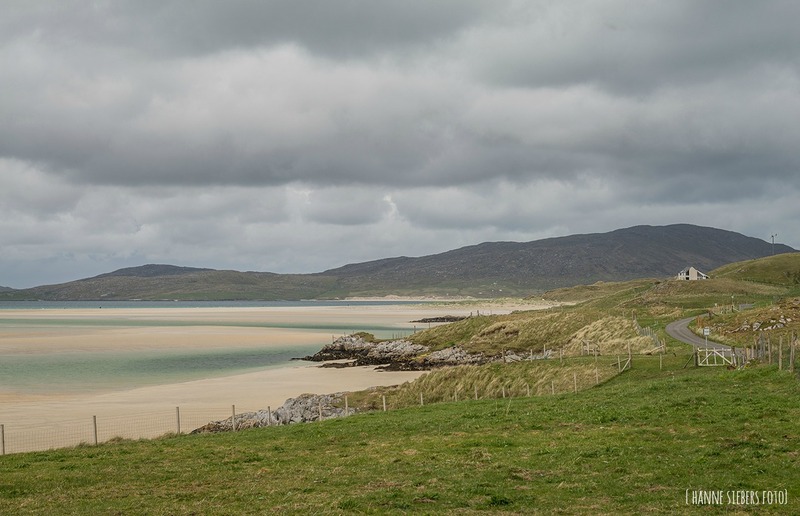 The Hebrides are so picturesque and beautiful and you have captured it’s “time-stopping” essence beautifully. I’ve only spent 24 hours there and was mesmerized, hope to be back this summer. Thank you VERY much. We keep our fingers crossed that you’ll be back soon! We stayed more than a week on Skye and a couple of days an Lewis and Harris, but we easily could have stayed much longer, especially on Skye. maybe you would like to read the comment and our answer to Tina’s commentary (just the next one). We would absolutely agree that both Siri and Selma are right. That is the beauty of deep thinking that quite often it ends up with paradoxes. Our world and their perception is not as one-dimensional as we sometimes would like it to be. For question of what do we perceive as beauty there is no easy answer. There are always two sides of the coin as you write – as the two opposite ideas of our clever Bookfayries. The German writer Goethe found his answer to this dilemma by writing the nature of reality is polarity. Or one might even say polarity is life. In the next posts you’ll read how we got on. I liked your response to Tina, but it also made me wonder about my own cultural influences…my perception of (natural) beauty was born in the north – and I still like the cool light (a bit exotic now), but then I saw the beauty of the savannah, where the air trembles and the warm colors melt together…polarity for sure. And interesting to ponder 🙂 Just like the Jaguar and the VW camper…but where does the Volvo fit into this? I personally think if we don’t think about beauty the notion of beauty becomes meaningless like interesting, nice etc. well, our reliable dear Volvo is the synthesis of the Jaguar and the VW bus: it’s fast and has lots of space as being an estate. As Dina was brought up in Norway and our dear Master partly in Sweden our idea of beauty was much influence by the North, clear lines, no embellishment, well, IKEA, Marimekko and Alvar Aalto was the ideal. Later we liked the Bauhaus. you will find some more reflections about beauty if you scroll down to Mariposa’s comment and answer – if it interests you. I just read about the history of theories of aethetics and got the idea, that from the ancient world up to the age of romanticism beauty was seen as harmonious proportions (symmetry, golden section etc.). It were mostly artefacts getting the epithet beautiful. This entirely changed from the age of romanticism onwards. Beauty became something that is moving the onlooker, it had to do with feelings. And so the nature became more and more beautiful 😉 We have not overcome this romantic feeling yet. F.e. it enhances the beauty for us when we are in the nature, like on such a beach, on our own. The lonely hero, the genii are the romantic ghosts that are still haunting us. How unusual to see such a tropical looking beach! I loved the question of what makes us feel the beauty of a place – very thought provoking. Personally, I think it always relates to the quality of light, often influenced by color. Sometimes a place can feel a bit boring but when revisited under different conditions seems very beautiful. Even people, if they have a certain light in their eyes, seem more beautiful. IMHO 🙂 of course. we fully agree that the light matters very much for our perception of beauty. There are lovers of the cold and clear nordic light like us and there are lovers of the warm hazy light of the South. It might have to do with the culture that formed you. The perception of beauty is quite influenced by ideology. We don’t have the answers but we find it inspiring to think about our perception. IMHO 🙂 🙂 we suppose that beauty has to do with polarity and wholeness; it is influenced by fashion and ideologies and by our exspectations. And light is important and maybe archetypal forms as well. Do you know “The History of Beauty” by Umberto Eco? you will find some more reflections about about beauty if you scroll down to Mariposa’s comment and answer – if it interests you. PS. Photos, as always, are spectacular! Thank you very much for liking our post! … and the journey will go on! Ich schleppe mich ins Ziel, noch 2 Tage kreatives Tanzen und dann Ferien! Danke für diesen sehr inspirierenden Blogbeitrag! Das Leben ist gerade wieder sehr interessant und wunderschön zugleich, spannend wie ein Krimi war es schon immer…. zuerst einmal ENTSPANNEND SCHÖNE FERIEN! Tja, man fährt heute eben nach Schottland, Skandinavien oder in die Arktis, da es dort bislang nicht von Touristen wimmelte und sicher ist. Aber das hat seine riesigen Nachteile: Island ist so voll gepackt mit Touristen, dass die Einheimischen sauer sind. Beim Fotografieren muss man sich mit Gewalt einen Platz schaffen, von dem man den Wasserfall oder was immer sieht. Norwegen wird auch allmählich überlaufen. Aber wer will schon nach Ibiza, Mallorca etc. und Türkey ist eh voll out, Griechenland auch nicht gerade beliebt. Naja, wir fanden es echt toll in Schottland, besonders im hohen Norden. Es war nicht störend touristisch. Das ist natürlich auch eine Frage des Timingsund welche Ecken man besucht. Fürchterlich touristisch, voll shocking, war’s auf der Rückfahrt am Loch Ness. Eigentlich hätten wir das alles in Geheimschrift schreiben sollen, jetzt locken wir auch noch die Leute nach Schottland. Tja, der Tourist zerstört das, was er liebt. Geheimsprache!? Wie wäre es zur Abwechslung mal mit Klartext! Das fanden die Ballettkinder etwas rückständig. Deshalb dachten wir, dass wir den Master der Farben mal nach Türkis und den Pastellfarben befragen könnten. Wie schafft es das Meer in Türkis zu leuchten und wer hat den Schafen diesen herrlichen Strichcode verpasst?! Und warum? Das interessiert uns doch sehr! Außerdem hätte Eda Suna, das kleine türkische Mädchen, das hier wunderschön tanzt gerne gewusst, was Türkey und Türkis gemeinsam haben?! Dass ihr Name Großmutter bedeutet, hat sie inzwischen verkraftet, sie ist erst 8 Jahre alt…. So, Siri und Selma, ich sende euch herzliche Grüße, vielleicht interessieren die Fragen meiner Tanzschüler auch ein wenig eure Leserschaft…wenn nicht, sorry!!! Wir sind ständig in Bewegung, da tauchen Fragen auf! Fangen wir erst einmal mit Pastellfarben und Türkis an. Goethe und schon kurz vor ihm LeBlon erkannten, dass es im Grunde nur 5 Farben gibt, die 3 Primärfarben und Schwarz und Weiß. Alle anderen Farben sind Abkömmlinge dieser Farben, also Mischfarben. Pastellfarben sind die Mischung einer oder mehrerer Primärfarben mit Weiß, also keine eigene 🎨 Farbe, sondern eine Mischfarbe. Ich erkläre das in meinem Farbbuch genauer im Kapitel über Pastellfarben. Türkis ist auch keine eigene 🎨 Farbe, sondern im Farbenkreis die Mitte zwischen Grün und Blau oder anders ausgedrückt, 50% Grün + 50% Blau. Türkis hat in der Tat etwas mit der Türkey zu tun. Die Farbe 🎨 ist nach dem Stein benannt, aus der ihr Pigment gewonnen wurde. Der Stein 💎 kommt zwar nicht aus der Türkey, aber die Türkey war der Haupthandelsort für Tükrkise. Warum sind die Schafe gekennzeichnet? Die farbliche Kennzeichnung zeigt nicht nur den Besitzer an sondern auch Alter und Zustand der Schafe. So werden z.B. auf den Orkneys kranke und auszusondernde Schafe mit einem roten Kreuz markiert. Die Markierungen sind von Gegend zu Gegend unterschiedlich. Also da hast du Recht, das ist quasi so etwas wie ein Strichcode oder besser gesagt ein Farbcode. as I wrote Dina is in Norway right now but she will love to read your kind commentry. Have you ever been traveling to a beach in Indonesia, such as Bali, Lombok, Raja Amat? no, we haven’t – oh, we actually think, Dina has, but she is in Norway right now. Well, we are more nordic, we don’t like so much when it’s sunny all the time and warm. We need dramatic skies, rain, a bit of mist and cool temperatures. You’ve captured nature’s tussle with itself beautifully through words and pictures. It’s fascinating how the weather can change from gloom to blue skies in an instant. Those dark grey clouds look intimidating. we think that those dark clouds give this landscape a special atmosphere that seems to us very Scottish. Thank you for your kind commentary. Jesus, so wonderful . I love the sparse landscapes, cloudy weather, wind and the sea. It is this mixture I’m really happy with. As always, superb pictures and explanatory text. Thanks a lot. we suppose this is a trip you would like to make as well. As further North we got as more manificient the landscape was. We’ll show some more pictures of the very North next. It’s the beauty of barren landscapes, high cliffs and endless boggy land surrounded by dark mountains. Sheer Scottish romantic. Thank you very much. Yes, Scotland has magnificient landscapes and as further North you go as greater the scenery is, breathtaking! You picture of the mating hornets (https://natuurfreak.wordpress.com/2017/06/30/parende-hoornaarvlinders/) is GREAT, like all your photos. We suppose you needed a lot of patience for such a shot. It was a wonderful trip. Great nature quite untouched up there in Scotland. You would really like it, the place for a natuurfreak to be. Scotland is beaufully dramatic and more so the further you are getting to the very north. the north of Scotland has this romantic and dramatic wildness, it’s magnificient and worth a visit. For visiting the Scotland’s north you have to be quick. We have the feeling that it will getting quite touristy there in the coming years. Certainly understand why it might be getting ‘more touristy’. Seems anywhere peaceful and quiet is attracting more interest. It looks harsh, but beautiful. we really love this harsh nordic beauty, barren and clear. you got it. It this mixture of harsh and beauty we like so much. I agree with Selma, these beautiful images say it all. Beautiful scenery, and I really love that bus stop! Yes. It really looks amazing. Beautiful pictures of a great landscape! Selma is right, beauty needs no explanation! 🙂 Beauty is pure, the unspoiltness! Nature is there to let us enjoy her pure unspoiltness, which is sometimes destroyed by humanity or treated with disrespect! well, some of us disagree with Selma. If you don’t reflect beauty you end up in kitsch. To think about beauty makes you understand what beauty really means, otherwise it becomes such a non-sense word like nice, interesting etc. In some comments and answers above we discussed the problem with beauty which is actually an old philosophical problem. One consense is that every artist needs a theory or at least a reflection what beauty is. In art and philosophy since Hegel and Kant there was a difference seen between the beauty of nature and the beauty of arts. The beauty of arts – like Dina’s photography – is a different reality as the beauty of nature. A picture follows the structures of the iconographic reality and the reality of the art world. It is not just a mirroring of the reality of nature. A beautiful picture of a landscape is of course different to a beautiful landscape. But the connection is perception, therefore it’s said “beauty lies in the eye of the beholder” (Plato). That means thinking about beauty is always self-reflective. Just to see is not enough, it helps to know how how you see and why. These are the arguments against Selma’s idea. On the other hand why should not both ideas at the same time be valid? As Niels Bohr once said in his talks with Einstein: A truth is only valid if it’s contrary is valid as well. From this point of view Selma’s idea as well as Siri’s idea are only kind of half right. The wholistic understanding would be that both ideas are right at the same time and the one needs the other. Anyway these are some ideas about beauty so far. Above, in the comments of Tiny and Tina you will find some more reflections about beauty. Good evening, dear Fab four of Cley, with art you can connect all kinds of theories about beauty and then you are right to discuss the beauty of it! If I look at the pictures that mainly show scenery, is it nature in that case. And nature, without human intervention, means to show us the beauty in all forms, pure and untouched! Or do I see it wrong? No, not at all, you don’t see that wrong. Nature has a beauty of complexity. But as nature isn’t aware of its beauty it’s us, the onlookers, who project our idea of beauty onto it. We are nordic by heart ❤️ and for us beauty is barren land with clear lines. we learned in our Fairy-School that you cannot connect ALL kinds of theories to art. Only certain theories of perception do fit. – We hope we understood it right. We have to ask our dear Master who wrote his thesis about theories of aesthetics, especially Hegel and Adorno. But in the end all these theories are based on perception. We have the feeling that they all can be traced back to Bishop George Berkeley’s ideas about perception. I am so happy that you are enjoying my views. Right or wrong is not a criterium but joy or boredom of the reader is it! Oh dear, what clever Bookfayries you are! I am impressed. Is this the new way of getting commentaries? There is not much to say right now as there is one post only. To get a blog running takes time and you just began. We have a problem to see what your blog is about. You don’t say this in “ABOUT” and it’s not obvious to us. 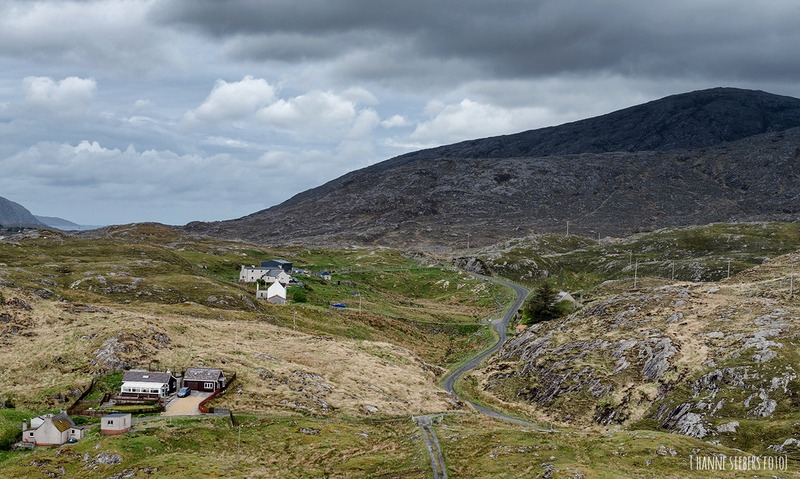 The hilly, rocky part of Lyskentyre in your first two photographs looks surprisingly like the terrain I recently saw in parts of the American states of Nebraska and South Dakota. We suppose those landscapes were formed by the same geological powers like vulcanism and ice. You find similar landscapes in Norway as well. They all originate in vulcanism and then the ice age. Even in Greenland and Svalbard we saw those landscapes. The nature between those American and European landscape are similar but the cultural landscape is VERY much different. And yet many Norwegians settled in the American state just east of South Dakota, Minnesota. on one hand we can see your point, on the other hand the Norwegians as the Germans, Italians and other European immigrants lost the connection with the vital culture of their homelands. The mass culture of the US soon made them all to consumers as everybody else. When we had to live in the US the groups of Germans there f.e. tried very hard to keep their German culture but for somebody from Germany that was a joke. We will say, landscape is not only physical but the culture based in history as well. And in this respect the coast of northern Scotland is genuin Scottish – and beside the physical we love this Scottishness, very small single track roads, little fishing villages, old fashioned shops etc. But we know neither Nebraska nor South Dakota, we lived several years in Vermont and Maine and sometimes worked in California for a term or two. 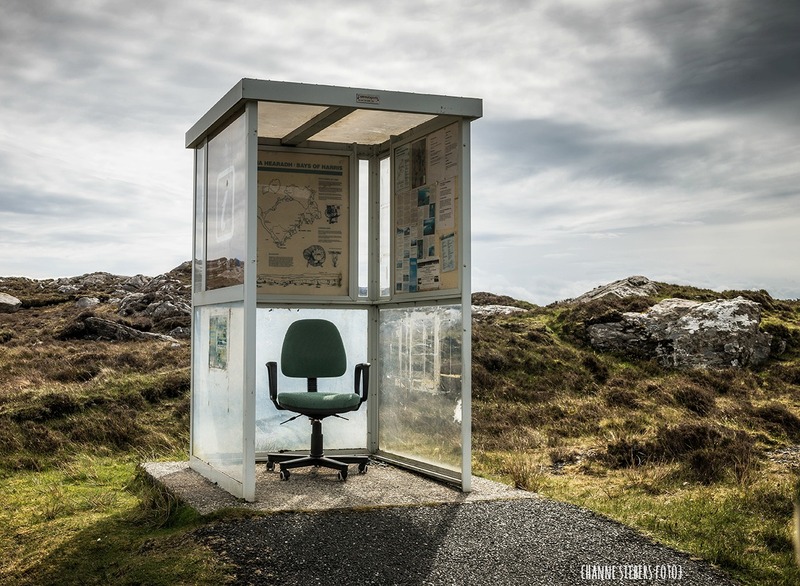 Gorgeous photos, my favourite is the bus stop with the office chair 😄. At least the passenger will be dry if the bus runs late. a 👍 great bus 🚌 stop, isn’t it! Thanks 🙏 for commenting and have a happy 😊 week. I waited for the bus to Otherland there which always runs late. This is simply a divine collection of images taken by Dina, supreme photography at its best! Thank you very much for your kind words. Great 👍 that could laugh 😂 about our trip. And as further north we got as more magnificient scenery we saw. Thank you very much, dear Nehal. We Fab Four are split about the idea if beauty needs an explanation. And maybe it’s different if you see it from the perspective of the onlooker or the producer. In European philosophy (from Hegel, Kant to Adorno) you make a difference between beauty of nature and beauty of art. When Siri and our dear Master thinks that beauty needs reflection then they think of beauty of arts. And concerning arts people differ in their judgement of what is beautiful and what is kitsch f.e. There exists quite a clever expolanation: beauty is a medium deviation from the horizon of exspections of the onlooker, kitsch is the fullfillment of the horizon of exspectation of the onlooker. The horizon of exspectation is formed by what you have perceived before. Anyway seeing it from this angle beauty is relative and not to forget it is dependant how ‘authorities’ see something. So Andy Warhol made us aware that the same object – in his case the Campbell tin – is no art and beautiful in the supermarket but put into a museum it is art. This formed the postmodern idea art is what is seen as art. And if some object is received as an aesthetical object then we can judge if it is beautiful or not. Okay that’s in short Siri’s and our dear Master’s idea about beauty. They always get so annoyed about all the kitsch in the internet. I agree, concept of beauty in the world of art is projected and so there are different perspectives of beauty….also it applies to the idea of commercialization of that art. We human beings like to complicate everything. But for me, atleast beauty is what I feel . Don’t need to see it or don’t expect to appear it so in conventional terms. i.e. photograph of the rocks on Lyskentyre Beach…so many lines of cracks on them…marks of the time gone by…makes them beauyiful! A truly mystifying country. It makes me think of Norway due to its landscape. Scotland and Norway are at places quite similar. It were the same geological powers forming both countries.